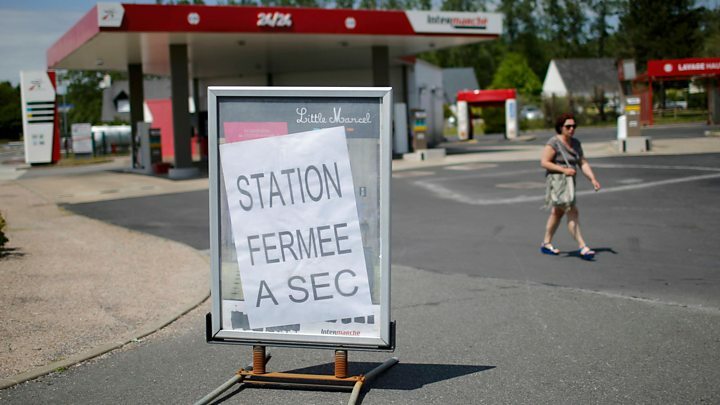 Strike action over labour law reforms gripped France on Thursday, with oil refineries, nuclear power stations and transport hubs disrupted. 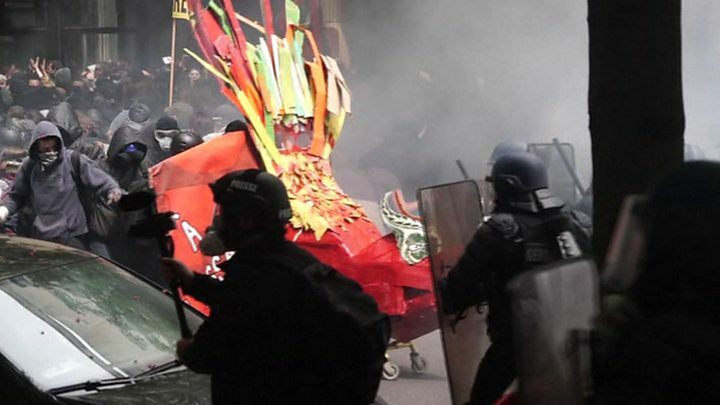 Riot police battled protesters in Paris and other cities, making 77 arrests, while 15 officers were injured and cars and shops were vandalised. Prime Minister Manuel Valls insists the reforms will not be withdrawn but has suggested they could be "modified". A state of emergency imposed after November's deadly attack by militants from the so-called Islamic State group in Paris remains in place. The CGT union is leading the action, supported by six other unions including Force Ouvriere and Unef, whereas the more moderate CFDT union backs the labour reforms. What are French workers complaining about? Tear gas filled the air as police in Paris struggled to contain a march which set off from Place de la Bastille. Of the arrests, 36 were made in the capital while other cities like Lyon and Bordeaux saw similar confrontations. Officials say 153,000 people took part across France though union leaders put the number at nearly twice that. Flights to and from Paris, Nantes and Toulouse were affected, and a rolling strike by train drivers brought further disruption to regional and commuter rail services. RTE, the body overseeing France's national power network, said stoppages at nuclear power stations were not having an immediate effect on electricity supply but warned, "If it worsens, it will have an impact on the management of the network." Five of the country's eight refineries remained at standstill or were operating at reduced capacity on Thursday. Mr Valls indicated there might "still be changes, improvements" made to the labour reform laws. But he rejected Finance Minister Michel Sapin's suggestion that Article 2 of the bill could be rewritten. Article 2 gives individual companies the power to opt out of national obligations on labour protection if they feel they need to - something the CGT union fiercely opposes. German Finance Minister Wolfgang Schaeuble backed the reform, saying: "France can live with such disputes." "A certain dissatisfaction of voters with their respective rulers isn't such a bad thing in principle," he added. Unions were enraged by the government's decision to use a constitutional device to allow its watered-down labour reforms to be made into law without parliamentary approval. The CGT has called for another day of action on 14 June, four days after Euro 2016 opens. "The government has the time to say 'let's stop the clock' and everything will be OK," CGT chief Philippe Martinez told Reuters news agency when asked if his union was willing to disrupt the tournament.